Above: A Beauty Professor profile is currently live on Fashionlush! Above: Erica Stolman's lifestyle blog has a gorgeous design aesthetic. First up, I am honored to currently be featured on the brilliant lifestyle blog, Fashionlush. I met the lovely Fashionlush Editor-in-Chief, Erica, a few months ago in Dallas and she subsequently reached out to do a Beauty Professor profile. 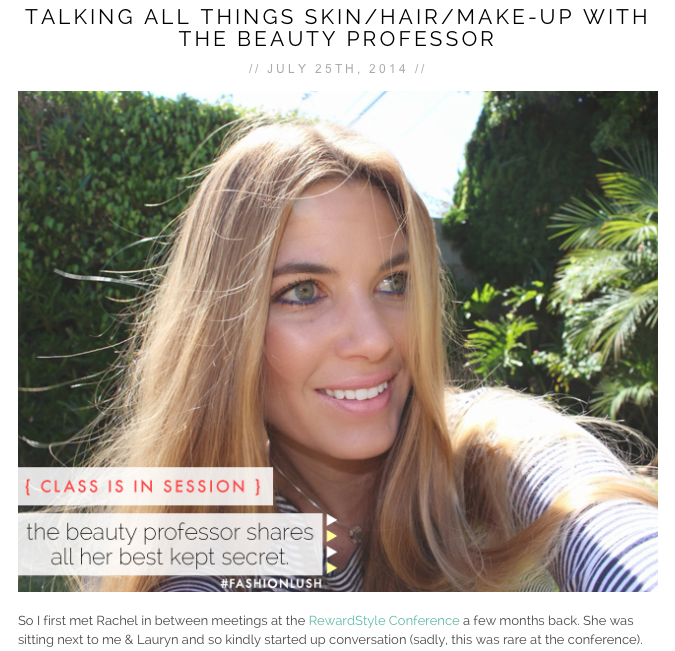 The post is chock full of beauty talk and I love her blog layout…so creative and aesthetically pleasing! Check out the full post HERE. Above: Behold! 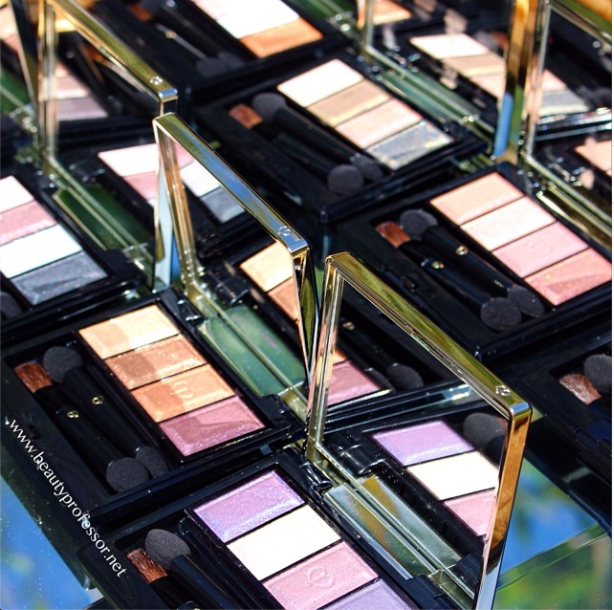 The many shades (32 to be exact) of the Cle de Peau eyeshadow quads for the Fall 2014 collection. Above: Did you know that Diptyque has a skincare line? 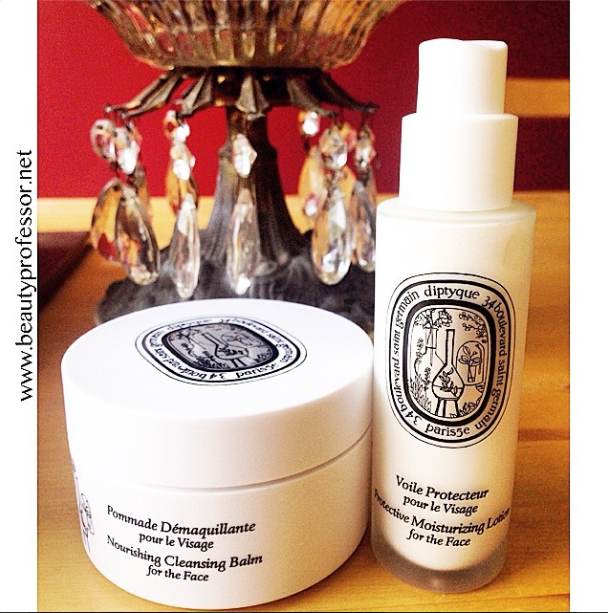 Over the past few days, I've been experimenting with the brand new Diptyque skincare line. Two immediate standouts for me are the Nourishing Cleansing Balm (silky and effective) and the Protective Moisturizing Lotion for the Face, which is incredibly light (excellent as a first base on warm days) with the most intoxicating scent. So far, both have played well with my insanely sensitive skin and I will make sure to update after I've tried all five products in the line, currently available at Neiman Marcus. Finally, the Jouer Summer 2014 Collection has arrived at Beauty Professor headquarters! The radiant Luminizing Cheek Tint in Rosy Glow adapts with one's chemistry to create the most flattering pale pink sheen and the delicate, ultra-hydrating Lip Sheer SPF 15 in Sheer Rosy Stain self-adjusts to the most flattering natural pink. More (including swatches) on this dynamic duo in the very near future! Bottom Line: So many lovely things in the works at Beauty Professor…with new Fall 2014 Collections and fresh product discoveries emerging daily, my camera is working overtime to capture the wonderment. A barrage of details coming soon! ** PR sample provided for review (the rest bought by me) however, as always, all of my opinions are expressly and unequivocally my own. You've read my mind yet again lol!! I think we share a brain sometimes! I have 2 of the CdP quads in my Saks cart but was waiting for reviews (I didn't have the best luck with the old quads...) but the new instillations look amazing! I was Googling the radiant foundation this morning and had no luck finding reviews so I can't wait to read your thoughts/see swatches, because you are my go-to authority on foundation! I'm also so stoked for the new Tom Ford Traceless Perfecting foundation...I ordered from NM yesterday and I'm hoping the shades run consistent with the Traceless stick formula ;) we shall see! Thanks bunches for all you do, I'm so excited for your upcoming CdP posts! I love it ; ) I am in the midst of labeling my CdP quad photos (it was A LOT of swatching!) and should hopefully have the post up by tonight. So far, I am completely impressed by the texture and pigmentation of these shadows...truly amazing and worth the splurge! Also, the Radiant foundation should be available August 1st but I think it can be ordered from Saks right now (I have a link to it in my most recent post). I am off to NM today and hope that I encounter all of the new TF products in person...that would be dreamy, indeed! Thanks for your kind words about my blog...I so appreciate your support! Hello...thanks so much for your kind feedback! So glad to hear that you are loving the new CdP releases...the eyeshadows (which are now up on my blog) are luxuriously pigmented and such a joy to wear. I have yet to be disappointed by anything in the CdP line...it truly lives up to the hype!